Fall is a relatively slow time of year for cataloging updates, since news from the ALA Annual Conference was reported earlier. 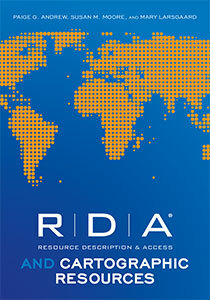 This fall, however, marks the publication by ALA Editions of RDA, Resource description & access and cartographic resources, written by Paige Andrew, Susan Moore, and Mary Lynette Larsgaard. MAGIRT – A Task Group of the Cataloging and Classification Committee of MAGIRT (Map & Geospatial Information Round Table) is continuing its work on Best practices for cataloging cartographic resources using RDA. A draft was shared at ALA Annual in June, but more work remains to be done. When finalized, it will be posted on the MAGIRT Libguide at http://magirt.ala.libguides.com/resources. By the way, in addition to comprehensive information about MAGIRT and its activities, this guide also contains numerous resources of help to the map and geospatial communities. Take a look! Under the aegis of the RBMS Bibliographic Standards Committee (BSC) and reporting to the BSC Chair, create an initial version of a consolidated Descriptive Cataloging for Rare Materials (DCRM) standard based on RDA (Resource Description and Access), building on the terminology, structure, and examples in RDA. Where appropriate, enlarge the scope of DCRM to include resources not covered in the present suite of DCRM manuals. In order to accomplish this task, the group will: engage the rare materials community throughout the development process through postings on a dedicated wiki, discussion on DCRM-L, and in meetings at Midwinter and Annual conferences; coordinate activity with the DCRM Steering Group; and communicate with format specialist communities, such as MLA, MAGIRT, and CONSER. Meagan Calogeras (Support Librarian, Government Documents & Maps Department, University of Hawai’i at Manoa Library) has just published a report in Japanese on cataloging Captured Japanese Maps (Japanese Imperial maps captured by the Allied occupation) in the Gaihozu Kenkyu Newsletter No. 11: ハワイ大学マノア校ハミルトン図書館における外邦図、内邦図の新たな発見と確認 The English-language article title is Captured Japanese Maps: Discovery and Cataloging at the University of Hawai’i at Manoa Library. Meagan apologizes that it is written in Japanese, but she thinks that it is important to publish it where the Japanese community can learn what is happening in a U.S. research library. Her article is the fifth entry in the table of contents: http://www.let.osaka-u.ac.jp/geography/gaihouzu/newsletter11/. The link to the pdf alone is here: http://www.let.osaka-u.ac.jp/geography/gaihouzu/newsletter11/pdf/n11_s2.pdf For non-Japanese readers, there are some interesting illustrations, and a bibliography that cites articles about Japanese mapping. Margaret Grimm reports on a new map collection within the Iowa Digital Library. A multi-year collaboration between the University of Iowa Libraries and the Iowa Geological Survey has culminated in the creation of the Iowa Historic Sheet Map Collection, viewable at http://digital.lib.uiowa.edu/sheetmaps. The metadata for images in this collection consists of data from both MARC records and Dublin Core metadata. • MAGIRT usually hosts a map-related “field trip” event on Friday afternoon, with a Dutch-treat dinner afterwards. • MAGIRT GIS Discussion Group usually meets on Saturday morning at 8:30, followed by the Map Collection Management Discussion at 10:30 in the same location. • MAGIRT Cataloging and Classification Committee (CCC) Meeting, Sunday morning at 10:30. Stay calm and catalog on!